How much time does your musical team get together to practice? Our band currently has four members (two guitars, one keyboard, and one who plays light percussion and adds harmony background vocals), we all like to sing, and we lead the music on a monthly basis (one Sunday per month). In preparation for this monthly service, we try to get together about three times a month (taking one week off) for about one hour each week. This equates to about three hours of group practice for one hour of leading musical worship. To me this seems just about right because you can hear the songs really coming together by the end of the second or the third practice depending on the complexity. Our band is made up of all seasoned musicians with a combined 100+ years of musical experience at our respective instruments so one might think that we don’t need much practice. But the thing is, each month we have new songs to learn so it’s important to get together to divide up who will be singing which parts, who will be driving the arrangement, what key signatures to use, how we will introduce the song, who will take solos and where (if at all), and most importantly to get the feel of the overall groove of the music. When a band practices together to hone their craft, the result is a coherent musical offering that invites congregational participation and helps in the overall flow of the worship service. Group practice allows time for the bass guitarist and drummer to work together to build the groove of the song and for the guitars and keyboards to provide the body and melody of the music. In addition to this week night practice time, we each practice solo at home and we listen to our monthly songs performed by the original recording artists on our individual MP3 players and email youtube versions of each song to one another. Finally, we meet together about a half hour before the worship service to check our balances and to run through that difficult part once more. In the end, we know each other very well. We can interpret looks from one another during worship. We know each others signals when something isn’t quite right; maybe the tempo needs to be adjusted based on the congregation’s singing, or maybe one of us is singing off-pitch (usually me). We are not only a band – we are friends who support one another and pray for each other. The bottom line is that bands need to spend time together because the worship life of the church improves when this happens. Worship this past Sunday was exciting, uplifting, worshipful and confessional – all rolled up into one Lutheran ball of biblically driven, Christ-centered reverent blessedness. This was a unique service for us as a guest band (The Branches Band) accompanied the musical portions of the liturgy. I knew things would be different when I saw all the Facebook activity including comments, emails and “likes” floating back and forth between members of our church discussing the upcoming worship service. This just doesn’t happen when things are routine. Every church should have the chance to experience something like this. The Branches Band is comprised of Andy Braun (acoustic guitar, harmonica and vocals), his wife, Rachel Braun (vocals, bongos, tambourine and shaker) and Jeremy Bakken (keyboards, bass guitar, acoustic 12 string guitar and vocals.) Their sound was tight and their harmonies inspiring in spite of the fact that I put them through the test of musical professionalism, which I would think, most Pastors and worship planners in our Synod would do. That is, I asked the band to play songs that thematically matched our worship theme and the scripture readings of the day. This forces the worship team to learn new pieces and puts the focus where it belongs. I got the impression that the band was used to this and that they handled the musical diversity that we required extremely well. Branches arrangements of our Lutheran hymns are truly refreshing. I was moved from the very start by the gathering hymn (“Praise to the Lord, the Almighty” – CW234) which set the stage for the entire worship service to follow. As a musician, I caught myself glancing over at Andy’s fret hand and saw that he was playing in the key of F, but capoed at the first fret and used chords in the key of E. The chord voicings were complex and colorful with a variety of open strings played in upper neck positions. I was so moved that after the service I raced out to their merchandise table to purchase a copy of the sheet music for the piece – which by the way contains all the chord shapes shown in grid diagrams (a very nice touch for us guitarists!). 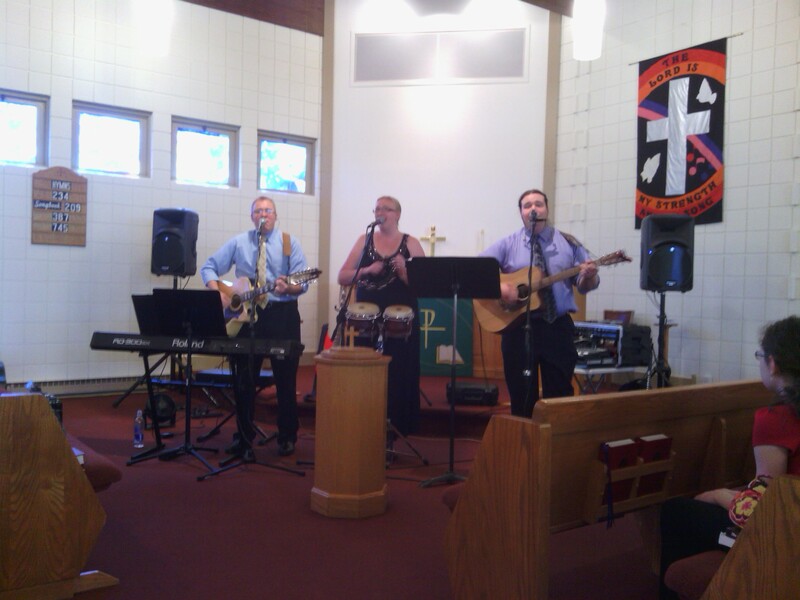 After a well attended and participatory worship we were treated to a concert of mostly Pentecost themed music. My favorites were the contemporary pieces: “Holy is the Lord” by Chris Tomlin, “You Never Let Go” by Matt Redman and “My Savior My God” by Aaron Shust but the band’s arrangement of “Nothing but the Blood” was equally incredible as Rachel’s gospel-styled vocals filled the sanctuary. I also greatly enjoyed a very unique arrangement of “What a Friend We Have in Jesus” which interestingly enough was marked by Braun’s subtle blues-like accompaniment. Technically he did this by hammering and pulling notes off the first position E-chord changing it from E to Em (a famous guitar blues-lick in any key). I was sitting with my fellow band mate, another guitarist, and we just looked at each other and grinned when we heard Brauns’ fretwork because we understood musically where he was coming from. From a worship perspective, the nicely muted blues vibe made it interesting for several reasons – first, I’ve sung that hymn well over a hundred times and it’s one of those hymns that I don’t need to look at the music because it’s committed to memory, so to me the stylistic change was just enough to make me think about those great lyrics again. And second, if you know the background of the hymn-writers life, you can understand why the blues can work. It is a fact that we can bring our “blues” to God in prayer, and know without a hint of doubt that He is listening, and answering as He sees fit. The congregation was asked to join in on this piece and I will also say that it brought a few tears to my eyes, something that this hymn has not done to me for decades. That’s how good and effective it was. This, the work of the Holy Spirit, for me using Braun’s accompaniment to affect me on some hidden level. There’s so much to this band – Rachel’s lovely voice and her tastefully added percussion, Braun’s guitar work and Bakken’s thumb-thumping bass lines (and he does play with his thumb!) but one other surprise that I wasn’t expecting was the falsetto that both Jeremy and Andy have and they do it well – especially on the a capella pieces. You can contact the band at their website if you are interested in having them accompany worship at your church or to host a concert – http://www.branchesband.com/. I highly recommend this because in our church; both hymn-lovers and contemporary music aficionados alike, were pleased, were comfortable with the worship, and more importantly were all participating in resounding brotherly love. And that, unfortunately, is not an easy thing to do these days! On June 17, we will be blessed by having the Branches Band accompany our worship service. Over the past several weeks I have been working with the Branches Band via email to plan and prepare for the service. After discussing the idea with our Pastor, it was decided to follow our typical contemporary worship format. This is a worship service meant to be accompanied by a keyboard/guitar style of music. The entire worship bulletin is included below. I have inserted a view videos of the Branches music where appropriate. Worship is not from tradition but from the heart. The following is contemporary worship. M: Who may ascend the hill of the Lord? Who may stand in his holy place? M: What does God say about each of us in his holy Word? C: He says that I am a sinner and deserve only his punishment. M: What should each of us do if we are not aware of our personal sins or are not troubled by them? C: I should examine myself according to the Ten Commandments and ask how well I have carried out my responsibilities as a husband or wife or single person, as a parent or child, an employer or employee, a teacher or student. Have I loved God with all my heart, gladly heard his Word, and patiently endured affliction? Have I been disobedient, proud, or unforgiving? Have I been selfish, lazy, envious, or quarrelsome? Have I lied or deceived, taken something not mine, or given anyone a bad name? Have I abused my body or permitted indecent thoughts to linger in my mind? Have I failed to do what is right and good? M: When each of us realize that we have sinned against God and deserve his punishment, what should each of us do? C: I will confess before God all my sins, those which I remember as well as those of which I am unaware. I will pray to God for his mercy and forgiveness. M: Dear friends, let us approach God with a true heart and confess our sins, asking him in the name of our Lord Jesus Christ to forgive us. C: Lord of life, I confess that I am by nature dead in sin. For faithless worrying and selfish pride, for sins of habit and sins of choice, for the evil I have done and the good I have failed to do, you should cast me away from your presence forever. O Lord, I am sorry for my sins. Forgive me, for Jesus sake. M: In the peace of forgiveness, let us sing praise to our Lord. C: according to your great compassion, blot out my transgressions. M: Wash away all my iniquity, and cleanse me from my sin. C: For I know my transgressions, and my sin is always before me. M: Surely I was sinful at birth, sinful from the time my mother conceived me. C: Surely you desire truth in the inner parts; you teach me wisdom in the inmost place. M: Cleanse me with hyssop, and I will be clean; wash me, and I will be whiter than snow. C: Let me hear joy and gladness; let the bones you have crushed rejoice. M: Hide your face from my sins and blot out all my iniquity. C: Create in me a pure heart, O God, and renew a steadfast spirit within me. M: O Lord, open my lips, and my mouth will declare your praise. C: The sacrifices of God are a broken spirit; a broken and contrite heart, O God, you will not despise. will also raise us with Jesus and present us with you in his presence. 15 All this is for your benefit, so that the grace that is reaching more and more people may cause thanksgiving to overflow to the glory of God. C: Alleluia. God was in Christ reconciling the world to himself, and entrusting to us the message of reconciliation. Alleluia. M: O Lord, our God, you are wise and powerful, good and gracious. Your mercies are new every morning. Each day you open your hand and provide for the needs of your children on earth. C: We praise you for every grace and blessing. proclaimed to troubled souls everywhere. C: Use our ministries and offerings to extend your healing and your hope. C: Grant us civil servants who are worthy of honor and respect. workers, and employees a feeling of joy and pride in their workmanship. C: Help us find satisfaction in all work well done. discover the wonders of your created order. C: Give us teachers and students who pursue excellence. parents. Give children and young people the wisdom to regard their parents as your representatives. C: Lead us to love one another as you have loved us. M: Hear us, Lord, as we bring you our private petitions. that you will respond for our welfare. Our Father, who art in heaven, hallowed be thy name, thy kingdom come, thy will be done on earth as it is in heaven. Give us this day our daily bread; and forgive us our trespasses, as we forgive those who trespass against us; and lead us not into temptation, but deliver us from evil. For thine is the kingdom and the power and the glory forever and ever. Amen. We’re so glad to have you with us today! We consider it a privilege to gather together to worship our Lord and hear from Him as he speaks to us from the Bible, His Word. If you are here with us for the first time, please introduce yourself to us and, when you have the opportunity, please sign our guest register, located in the back of the worship area. If you are in need of any assistance at all, please speak with one of our ushers who would be very happy to assist you. May God bless our worship together today! O Lord – our Maker, Redeemer, and Comforter – we are assembled in your presence to hear your holy Word. We pray that you would open our hearts by your Holy Spirit that through the preaching of your Word we may repent of our sins, believe in Jesus, and grow day by day in grace and holiness. Hear us for Jesus’ sake. Amen. That after all is said and heard, I gladly may obey. Amen. Father, I have sinned against you and am no longer worthy to be called your child. Especially am I sorry for ___________. Yet in mercy you sacrificed your only Son to purge away my guilt. For his sake, O God, be merciful to me, a sinner, and in the joy of your Holy Spirit let me serve you all my days. Amen. Lord God, give me strength and willingness to say with your Son, “Not my will but your will be done.” Make me cheerful and trusting to bear whatever you let happen to me. From your hand I am willing to take the good and the bad, the joy and the sorrow. Keep me from sin, gracious Father, and comfort me with your kind Word. Amen. Many of you know that this is an acronym for “Hymn of the Day.” The HOTD is the musical piece that precedes the sermon. Lyrically it is the hardest hitting piece of the worship set, is spot-on with the readings and sometimes is even referred to by the Pastor in his sermon. The relationship between the pastor and the worship leader, or the musical director depending on your church’s nomenclature, is a delicate but fulfilling friendship; at least it always has been for me. It is a relationship that takes time to develop. It is a relationship that needs to be worked at, prayed over, and a certain level of trust needs to be established before true harmony can shine in their worship planning together. The relationship is a wonderful two way street of learning, sharing and supporting. To be truthful, the information flow is usually more from the Pastor to the Worship Leader who has usually not had any formal theological training (as in my case) but I will say this, our Pastor now knows who both Keith Getty & Chris Tomlin are and he’s even added a few contemporary pieces to his list of favorites, and I now know that pericope is not part of a submarine and I know the differences between propers and ordinaries. One of the things that our Pastor brought to our church, and has taught me, is a format that he likes to use for the HOTD. I’m not sure where this came from, but his preference is to introduce the hymn with a musical lead-in and then to have a musical interlude between the last two verses. For a musician, this is a delight, and it doesn’t matter if you are an organist playing a hymn or a praise band member joining in on the latest contemporary piece. This is your chance to glorify God and to serve your people in a very special way. It is a chance to use your gifts and to use that God-given creativity. And I also must say, that when sitting in the pew, this is also a very special worship moment for the people in attendance because for me, it’s a respite where I take advantage of the musical backdrop to think about what I am saying in that particular song. On traditional Sundays, our organists actually pull out a fugue or other favorite classical piece in the same key as the hymn to use as their interlude. On blended Sundays, either our keyboard player or the guitarist plays a solo typically based off the melody line. We use this format throughout the church year, with the exception of during Lent. It is a worship practice that I recommend to you. The only word of caution is that the Pastor needs to announce your intentions before the piece is played, otherwise your people won’t know to keep silent during the interlude. Several summers ago, I hosted a weekly series of bible classes after worship at my church that focused on a different song each week. We considered both hymns and contemporary pieces. The following is a sample class using “On Eagle’s Wing’s” . Being summertime, we limited the duration of the classes to about 20 minutes. We finished each class by singing the song that was covered that day. The snare of the fowler will never capture you, And famine will bring you no fear; Under His Wings your refuge, His faithfulness your shield. 3 Surely he will save you from the fowler’s snare and from the deadly pestilence. 4 He will cover you with his feathers, and under his wings you will find refuge; his faithfulness will be your shield and rampart. Though thousands fall about you, Near you it shall not come. 5 You will not fear the terror of night, nor the arrow that flies by day, 6 nor the pestilence that stalks in the darkness, nor the plague that destroys at midday. 7 A thousand may fall at your side, ten thousand at your right hand, but it will not come near you. 8 You will only observe with your eyes and see the punishment of the wicked. 9 If you make the Most High your dwelling— even the LORD, who is my refuge- 10 then no harm will befall you, no disaster will come near your tent. For to His angels He’s given a command, To guard you in all of your ways, Upon their hands they will bear you up, Lest you dash your foot against a stone. 11 For he will command his angels concerning you to guard you in all your ways; 12 they will lift you up in their hands, so that you will not strike your foot against a stone. 3. What is the significance of the title “On Eagle’s Wings”? Exodus 19:4 You yourselves have seen what I did to Egypt, and how I carried you on eagles’ wings and brought you to myself. 1. What part of Ps 91 did Satan quote? 2. Satan misused scripture in an attempt to trick Jesus. What is the proper interpretation of Ps 91:11? Notice that Martin Luther uses the phrase “Let Your Holy Angles be with me, so that the evil enemy will not gain power over me” in both morning and evening prayer. Luther knew the importance of angles – they guard us against the devil. When the psalmist declares that the angels attend us in all of our ways, the understanding is that we have their coverage as we exercise our God-pleasing, Christian vocation. The promise does not extend to activities that are sinful or that put God to the test. When Satan tempted Jesus to leap from the highest point of the temple, he quoted this passage but left out some important words. Our Lord refused to yield to this temptation, for He knew the omitted phrase “in all your ways” did not assure Him of angelic protection for so foolish an act. The function of angels is threefold: to praise God, to carry out His commands, and to serve mankind. My Heavenly Father, I thank You, through Jesus Christ, Your beloved Son, that You have protected me, by Your grace. Forgive, I pray, all my sins and the evil I have done. Protect me, by Your grace, tonight. I put myself in your care, body and soul and all that I have. Let Your holy angels be with me, so that the evil enemy will not gain power over me. Amen. 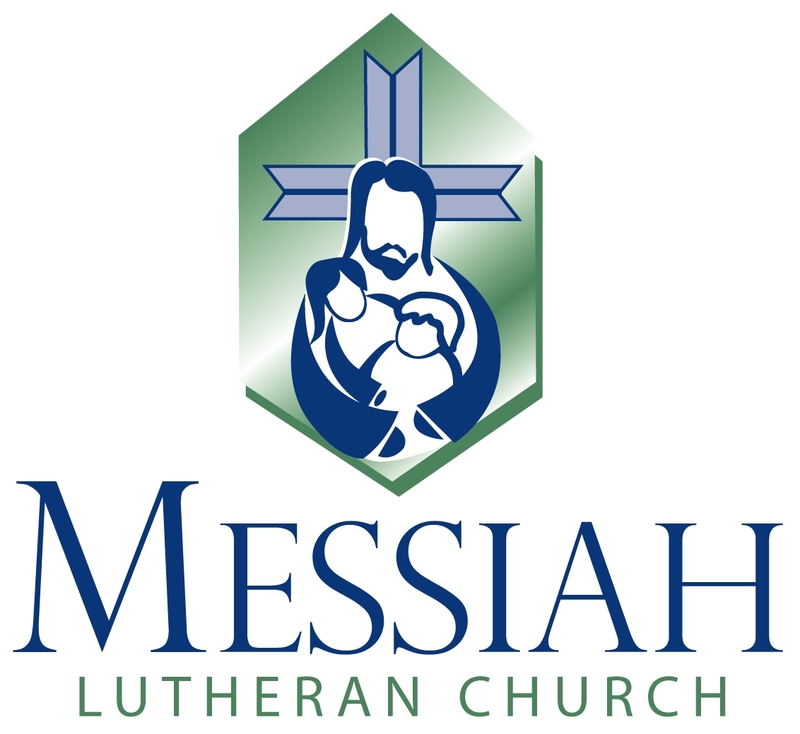 The Michigan Lutheran Seminary Choir performed at Messiah Lutheran Church in South Windsor, CT on April 16 at 7:00 PM. Thirty High School teens and two adult leaders drove in a bus, overnight, from Saginaw MI to South Windsor, CT, some 700 to 800 miles and 14 hours on the road; many of them sleeping the best they could on the floor of the bus. There’s something about seeing this age group, traveling this distance, and singing hymns that reminds one that there is still a lot of good in this world. The sound that filled our small sanctuary that evening was beyond description; so I will simply mention a few of my favorites and offer a few observations that I found to be noteworthy. The choir opened up the evening with “God’s Word is Our Great Heritage” which seems to be the credo for the entire Seminary and whose lyrics add support to their existence. Shortly thereafter, the choir sang a piece titled “At the Name of Jesus” accompanied by Hans Thomford on the organ and I could not help but be inspired by their vocal dynamics and I knew then and there that the night was going to be special with the resounding chorus of amens contained in this piece. Another favorite of mine was a Bach arrangement called “Crucifixus”, accompanied by Catherine Webber on the keys and sung in English. The layered singing in this piece was particularly impressive. My favorite song of the evening was “the Power of the Cross” by the Celtic songwriting team of Stuart Townend and Keith Getty. This was accompanied by Prof. Leonard A. Proeber on the keys and the pristine vocals and incredible lyrics brought the story of Christ’s sacrifice to life for me that evening. Another favorite of mine was a piece called “Then Will the Very Rocks Cry Out” by Mark Hayes. This was a lively piece and what I found to be interesting was how the singers were taking a subtle hand motion from their leader Prof. Proeber and amplifying it into a massive, cohesive, swaying back-and-forth motion that echoed the groove of the piece and drew me into the spirit of the song. As the choir sang “Jesus Loves Me”, I could not help but notice the genuine contagious smiles on their faces and it reminded me that in worship, we never get to see each others expressions as we sing. It was a wonderful site to behold and somehow they also worked a resounding “YES” into this classic hymn as well. During a spiritual song titled “You Can Tell the World about This”, I was moved by the repeated lyric “You Can Tell, You Can Tell, You Can Tell…” and by the phenomenal solo performance added by Catherine Webber. As a musician, I took special note at how one student accompanied everyone who took turns at either the keys or the organ and tapped out the tempo on each instrument to help the musicians keep time. She was their human metronome and helped to hold the music together. Finally, I must not forget the guitarist; Evan Lehr who accompanied a hymn titled “O Thou in Whose Presence”, unplugged and with a beautiful maple-colored Seagull guitar. Nice job! In total, it was a wonderful and worshipful evening and the perfect event to kick off our Holy Week observations. Hosting this group is a very special treat not only musically but it also benefits the worship life of the congregation and these kids serve as excellent role models to your congregation’s children as well. I still have fond memories from the past when we have hosted this choir and have taken a few of these students into our house where we have had a better chance to get to know them and see them interact with our own families. They are a blessing to our Synod and our churches and I thank them for all the time and energy that goes into the preparation and delivery of each concert. Actually and thankfully, many WELS churches still have choirs while a few have relied more heavily on “praise bands” to lead the congregation in musical worship. My church makes use of both, but the most important musical group is the congregation itself. As God’s people we are to lift up our voices in a unified chorus of worship, praise and adoration to our God and King; but this is not to say that there is not a place for gifted and trained musicians to assist in the area of corporate singing. I believe that there is a place for both the praise band model and the use of choirs in corporate worship. The praise band model is founded in Old Testament worship notably being led by the Levitical musicians. And using a choir adds an entirely new dimension by helping the congregation to sing better as well as beautifying our musical offerings. Moreover, the choir adds volume, sonic depth, dynamics, diction, rhythm and timing, and most of all – multi-part harmonies. An additional benefit of choirs is their ability, through God’s gifting and by the Holy Spirit’s guidance, to keep hymn singing alive and vibrant in our congregations. I say this because most hymns are specifically written for four part harmonies and many also have descants for the sopranos and tenors. I encourage today’s contemporary church’s that rely solely on praise bands to consider starting and using choir ensembles as well. Just the use of harmonies alone are worthy of the effort required and are a great way to glorify our Lord. Conversely, traditional churches can benefit by using some lighter contemporary pieces whose lyrics are a bit easier to grasp than some meaty hymns might be. The Michigan Lutheran Seminary Choir will be performing at my church (Messiah Lutheran Church in South Windsor, CT) on Saturday evening, April 16, 2011 at 7:00PM. Consider yourself invited if you are in the area. Congratulations for 25 years in ministry! Praise God! On Sunday, Nov. 21, 2010, at 9:00 AM, our church will be celebrating the fact that God has led our Pastor (Timothy Ehlers) into his 25th year of Pastoral ministry. Pastor Ehlers is a gifted preacher, teacher and musician (vocalist, technologist & MIDI producer extraordinaire). Pastor Ehlers will be preaching and conducting the service. God, thank you for this gifted man who you have blessed us with and if its Your will, grant him another fruitful 25 years of service dedicated to your glory. Amen.